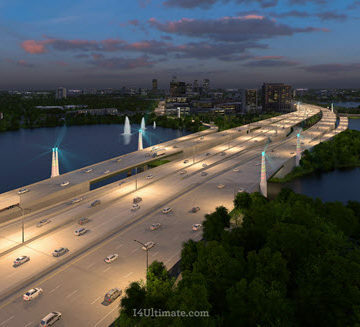 The Institute for Sustainable Infrastructure (ISI) awarded the I-4 Ultimate Improvement Project in central Florida with the Envision Platinum for its 21-mile reconstruction project. 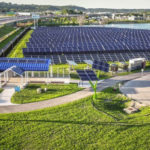 This is the first project in Florida to receive recognition from ISI’s Envision sustainable infrastructure rating system, and it stands as one of the largest Envision-verified projects to date. 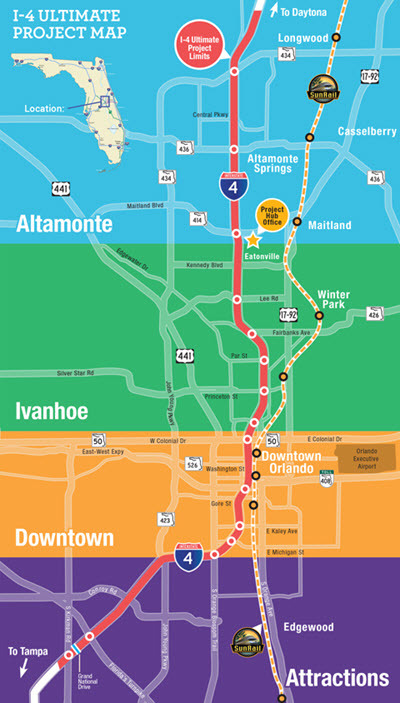 The I-4 Ultimate Project involves the reconstruction of 21 miles of roadway infrastructure from west of Kirkman Road in Orange County through downtown Orlando, extending to the east of State Road 434 in Seminole County. “We are so excited to receive the Envision Platinum recognition for the efforts of the entire I-4 Ultimate Improvement team to protect the environment[,] from water to wildlife to air quality, while creating a signature corridor for the entire region,” said Loreen Bobo, P.E., I-4 Ultimate construction program manager for the Florida Department of Transportation (FDOT). 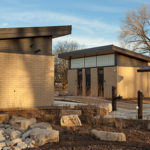 The project is expected to transform the region by better connecting communities, improving the local economy, and enhancing livability for residents. One of the most important benefits will be the improvement of traffic flow by easing congestion: I-4 Ultimate will add four new variable-toll express lanes and reconstruct 15 major interchanges, which includes widening 13 bridges, replacing 74 bridges, and building 53 new bridges, along with a pedestrian overpass on Kirkman Road and a signature pedestrian bridge at Maitland interchange. When complete, the project will provide a visually appealing signature corridor with bold landscaping, accent lighting, enhanced bridge architecture, and other aesthetic features. 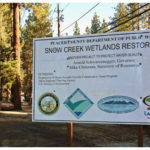 The project also showed strong sustainable building strategy in its attention to environmental impacts, including relocating protected wildlife, using efficient machinery, controlling stormwater runoff, planting noninvasive vegetation, and recycling 99 percent of the concrete and steel removed from roads and bridges. 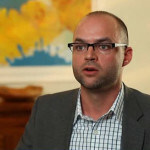 As well, the endeavor facilitates the use of alternative transportation by integrating rail projects and improving pedestrian crossings and connections with bike trails. This includes a $750,000 fund that is established to promote alternate transportation modes during construction. Several industry leaders formed the I-4MP team to design, build, finance, and operate the project through a 40-year P3 concession agreement with a total design and construction cost of $2.32 billion. For more information on the project, visit the I4 Improvement Project website.